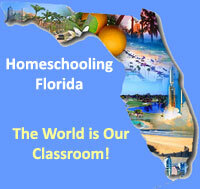 What are the homeschooling laws in FL? Chapter 1002 of the Florida State Statutes is where the state defines the terms related to homeschooling and establishes the laws of the state regarding "Student and Parental Rights and Educational Choices." Click here to go to the page on the Florida Legislature's website where you can read the entire chapter. 1002.01 Definitions. (1) A "home education program" means the sequentially progressive instruction of a student directed by his or her parent in order to satisfy the attendance requirements of ss. 1002.41, 1003.01(4), and 1003.21(1). 1) A "home education program" is defined in s. 1002.01. The parent is not required to hold a valid regular Florida teaching certificate. (a) The parent shall notify the district school superintendent of the county in which the parent resides of her or his intent to establish and maintain a home education program. The notice shall be in writing, signed by the parent, and shall include the names, addresses, and birthdates of all children who shall be enrolled as students in the home education program. The notice shall be filed in the district school superintendent's office within 30 days of the establishment of the home education program. A written notice of termination of the home education program shall be filed in the district school superintendent's office within 30 days after said termination. (b) The parent shall maintain a portfolio of records and materials. The portfolio shall consist of the following: 1. A log of educational activities that is made contemporaneously with the instruction and that designates by title any reading materials used. 2. Samples of any writings, worksheets, workbooks, or creative materials used or developed by the student. The portfolio shall be preserved by the parent for 2 years and shall be made available for inspection by the district school superintendent, or the district school superintendent's agent, upon 15 days' written notice. Nothing in this section shall require the district school superintendent to inspect the portfolio. 5. The student shall be evaluated with any other valid measurement tool as mutually agreed upon by the district school superintendent of the district in which the student resides and the student's parent. (2) The district school superintendent shall review and accept the results of the annual educational evaluation of the student in a home education program. If the student does not demonstrate educational progress at a level commensurate with her or his ability, the district school superintendent shall notify the parent, in writing, that such progress has not been achieved. The parent shall have 1 year from the date of receipt of the written notification to provide remedial instruction to the student. At the end of the 1-year probationary period, the student shall be reevaluated as specified in paragraph (1)(c). Continuation in a home education program shall be contingent upon the student demonstrating educational progress commensurate with her or his ability at the end of the probationary period. (3) A home education program shall be excluded from meeting the requirements of a school day. (4) Home education students may participate in interscholastic extracurricular student activities in accordance with the provisions of s. 1006.15. (5) Home education students may participate in the Bright Futures Scholarship Program in accordance with the provisions of ss. 1009.53-1009.539. (6) Home education students may participate in dual enrollment programs in accordance with the provisions of ss. 1007.27(4) and 1007.271(10). (7) Home education students are eligible for admission to community colleges in accordance with the provisions of s. 1007.263. (8) Home education students are eligible for admission to state universities in accordance with the provisions of s. 1007.261. (9) Home education program students may receive testing and evaluation services at diagnostic and resource centers, in accordance with the provisions of s. 1006.03. 1002.43 Private tutoring programs. (1) Regular school attendance as defined in s. 1003.01(13) may be achieved by attendance in a private tutoring program if the person tutoring the student meets the following requirements: (a) Holds a valid Florida certificate to teach the subjects or grades in which instruction is given. (b) Keeps all records and makes all reports required by the state and district school board and makes regular reports on the attendance of students in accordance with the provisions of s. 1003.23(2). (c) Requires students to be in actual attendance for the minimum length of time prescribed by s. 1011.60(2). (2) Private tutors shall keep and prepare records in accordance with the provisions of s. 1003.23(2). 1003.01 Definitions. 13) "Regular school attendance" means the actual attendance of a student during the school day as defined by law and rules of the State Board of Education. Regular attendance within the intent of s. 1003.21 may be achieved by attendance in: (a) A public school supported by public funds; (b) A parochial, religious, or denominational school; (c) A private school supported in whole or in part by tuition charges or by endowments or gifts; (d) A home education program that meets the requirements of chapter 1002; or (e) A private tutoring program that meets the requirements of chapter 1002. 1003.21 School attendance. (1)(a)1. All children who have attained the age of 6 years or who will have attained the age of 6 years by February 1 of any school year or who are older than 6 years of age but who have not attained the age of 16 years, except as otherwise provided, are required to attend school regularly during the entire school term. 1003.23 Attendance records and reports. (2) All officials, teachers, and other employees in public, parochial, religious, denominational, and private K-12 schools, including private tutors, shall keep all records and shall prepare and submit promptly all reports that may be required by law and by rules of the State Board of Education and district school boards. Such records shall include a register of enrollment and attendance and all persons described above shall make these reports therefrom as may be required by the State Board of Education. The enrollment register shall show the absence or attendance of each student enrolled for each school day of the year in a manner prescribed by the State Board of Education. The register shall be open for the inspection by the designated school representative or the district school superintendent of the district in which the school is located. Violation of the provisions of this section shall be a misdemeanor of the second degree, punishable as provided by law. This section shall not apply to home education programs provided in s. 1002.41. 1003.43 General requirements for high school graduation. Addresses the miniumum of 24 academic credits needed for graduation. States the distribution of those credits. 1006.03 Diagnostic and learning resource centers (1) The department shall maintain regional diagnostic and learning resource centers for exceptional students, to assist in the provision of medical, physiological, psychological, and educational testing and other services designed to evaluate and diagnose exceptionalities, to make referrals for necessary instruction and services, and to facilitate the provision of instruction and services to exceptional students. The department shall cooperate with the Department of Children and Family Services in identifying service needs and areas. (2) Within its identified service area, each regional center shall: (a) Provide assistance to parents, teachers, and other school personnel and community organizations in locating and identifying exceptional children and planning educational programs for them. (b) Assist in the provision of services for exceptional children, using to the maximum, but not supplanting, the existing facilities and services of each district. (c) Provide orientation meetings at least annually for teachers, principals, supervisors, and community agencies to familiarize them with center facilities and services for exceptional children. (d) Plan, coordinate, and assist in the implementation of inservice training programs, consistent with each district's program of staff development, for the development and updating of attitudes, skills, and instructional practices and procedures necessary to the education of exceptional children. (e) Assist districts in the identification, selection, acquisition, use, and evaluation of media and materials appropriate to the implementation of instructional programs based on individual educational plans for exceptional children. (f) Provide for the dissemination and diffusion of significant information and promising practices derived from educational research, demonstration, and other projects. (g) Assist in the delivery, modification, and integration of instructional technology, including microcomputer applications and adaptive and assistive devices, appropriate to the unique needs of exceptional students. (3) Diagnostic and resource centers may provide testing and evaluation services to private school students and other children who are not enrolled in public schools. (4) Diagnostic and learning resource centers may assist districts in providing testing and evaluation services for infants and preschool children with or at risk of developing disabilities, and may assist districts in providing interdisciplinary training and resources to parents of infants and preschool children with or at risk of developing disabilities and to school readiness programs. 1006.15 Student standards for participation in interscholastic extracurricular student activities; (1) This section may be cited as the "Craig Dickinson Act." (2) Interscholastic extracurricular student activities are an important complement to the academic curriculum. Participation in a comprehensive extracurricular and academic program contributes to student development of the social and intellectual skills necessary to become a well-rounded adult. As used in this section, the term "extracurricular" means any school-authorized or education-related activity occurring during or outside the regular instructional school day. (3)(a) To be eligible to participate in interscholastic extracurricular student activities, a student must: 1. Maintain a grade point average of 2.0 or above on a 4.0 scale, or its equivalent, in the previous semester or a cumulative grade point average of 2.0 or above on a 4.0 scale, or its equivalent, in the courses required by s. 1003.43(1). 2. Execute and fulfill the requirements of an academic performance contract between the student, the district school board, the appropriate governing association, and the student's parents, if the student's cumulative grade point average falls below 2.0, or its equivalent, on a 4.0 scale in the courses required by s. 1003.43(1) or, for students who entered the 9th grade prior to the 1997-1998 school year, if the student's cumulative grade point average falls below 2.0 on a 4.0 scale, or its equivalent, in the courses required by s. 1003.43(1) that are taken after July 1, 1997. At a minimum, the contract must require that the student attend summer school, or its graded equivalent, between grades 9 and 10 or grades 10 and 11, as necessary. 3. Have a cumulative grade point average of 2.0 or above on a 4.0 scale, or its equivalent, in the courses required by s. 1003.43(1) during his or her junior or senior year. 4. Maintain satisfactory conduct and, if a student is convicted of, or is found to have committed, a felony or a delinquent act which would have been a felony if committed by an adult, regardless of whether adjudication is withheld, the student's participation in interscholastic extracurricular activities is contingent upon established and published district school board policy. (b) Any student who is exempt from attending a full school day based on rules adopted by the district school board for double session schools or programs, experimental schools, or schools operating under emergency conditions must maintain the grade point average required by this section and pass each class for which he or she is enrolled. (c) An individual home education student is eligible to participate at the public school to which the student would be assigned according to district school board attendance area policies or which the student could choose to attend pursuant to district or interdistrict controlled open enrollment provisions, or may develop an agreement to participate at a private school, in the interscholastic extracurricular activities of that school, provided the following conditions are met: 1. The home education student must meet the requirements of the home education program pursuant to s. 1002.41. 2. During the period of participation at a school, the home education student must demonstrate educational progress as required in paragraph (b) in all subjects taken in the home education program by a method of evaluation agreed upon by the parent and the school principal which may include: review of the student's work by a certified teacher chosen by the parent; grades earned through correspondence; grades earned in courses taken at a community college, university, or trade school; standardized test scores above the 35th percentile; or any other method designated in s. 1002.41. 3. The home education student must meet the same residency requirements as other students in the school at which he or she participates. 4. The home education student must meet the same standards of acceptance, behavior, and performance as required of other students in extracurricular activities. 5. The student must register with the school his or her intent to participate in interscholastic extracurricular activities as a representative of the school before the beginning date of the season for the activity in which he or she wishes to participate. A home education student must be able to participate in curricular activities if that is a requirement for an extracurricular activity. 6. A student who transfers from a home education program to a public school before or during the first grading period of the school year is academically eligible to participate in interscholastic extracurricular activities during the first grading period provided the student has a successful evaluation from the previous school year, pursuant to subparagraph 2. 7. Any public school or private school student who has been unable to maintain academic eligibility for participation in interscholastic extracurricular activities is ineligible to participate in such activities as a home education student until the student has successfully completed one grading period in home education pursuant to subparagraph 2. to become eligible to participate as a home education student. (d) An individual charter school student pursuant to s. 1002.33 is eligible to participate at the public school to which the student would be assigned according to district school board attendance area policies or which the student could choose to attend, pursuant to district or interdistrict controlled open-enrollment provisions, in any interscholastic extracurricular activity of that school, unless such activity is provided by the student's charter school, if the following conditions are met: 1. The charter school student must meet the requirements of the charter school education program as determined by the charter school governing board. 2. During the period of participation at a school, the charter school student must demonstrate educational progress as required in paragraph (b). 3. The charter school student must meet the same residency requirements as other students in the school at which he or she participates. 4. The charter school student must meet the same standards of acceptance, behavior, and performance that are required of other students in extracurricular activities. 5. The charter school student must register with the school his or her intent to participate in interscholastic extracurricular activities as a representative of the school before the beginning date of the season for the activity in which he or she wishes to participate. A charter school student must be able to participate in curricular activities if that is a requirement for an extracurricular activity. 6. A student who transfers from a charter school program to a traditional public school before or during the first grading period of the school year is academically eligible to participate in interscholastic extracurricular activities during the first grading period if the student has a successful evaluation from the previous school year, pursuant to subparagraph 2. 7. Any public school or private school student who has been unable to maintain academic eligibility for participation in interscholastic extracurricular activities is ineligible to participate in such activities as a charter school student until the student has successfully completed one grading period in a charter school pursuant to subparagraph 2. to become eligible to participate as a charter school student. (4) The student standards for participation in interscholastic extracurricular activities must be applied beginning with the student's first semester of the 9th grade. Each student must meet such other requirements for participation as may be established by the district school board; however, a district school board may not establish requirements for participation in interscholastic extracurricular activities which make participation in such activities less accessible to home education students than to other students. Except as set forth in paragraph (3)(c), evaluation processes or requirements that are placed on home education student participants may not go beyond those that apply under s. 1002.41 to home education students generally. (5) Any organization or entity that regulates or governs interscholastic extracurricular activities of public schools: (a) Shall permit home education associations to join as member schools. (b) Shall not discriminate against any eligible student based on an educational choice of public, private, or home education. (6) Public schools are prohibited from membership in any organization or entity which regulates or governs interscholastic extracurricular activities and discriminates against eligible students in public, private, or home education. (7) Any insurance provided by district school boards for participants in extracurricular activities shall cover the participating home education student. If there is an additional premium for such coverage, the participating home education student shall pay the premium. 1007.27 Articulated acceleration mechanisms. (4) It is the intent of the Legislature to provide articulated acceleration mechanisms for students who are in home education programs, as defined in s. 1002.01, consistent with the educational opportunities available to public and private secondary school students. Home education students may participate in dual enrollment, career dual enrollment, early admission, and credit by examination. Credit earned by home education students through dual enrollment shall apply toward the completion of a home education program that meets the requirements of s. 1002.41. 1007.271 Dual enrollment programs. (1) The dual enrollment program is the enrollment of an eligible secondary student or home education student in a postsecondary course creditable toward a career certificate or an associate or baccalaureate degree ... (10)(a) The dual enrollment program for home education students consists of the enrollment of an eligible home education secondary student in a postsecondary course creditable toward an associate degree, a career certificate, or a baccalaureate degree. To participate in the dual enrollment program, an eligible home education secondary student must: 1. Provide proof of enrollment in a home education program pursuant to s. 1002.41. 2. Be responsible for his or her own instructional materials and transportation unless provided for otherwise. (b) Each career center, community college, and state university shall: 1. Delineate courses and programs for dually enrolled home education students. Courses and programs may be added, revised, or deleted at any time. 2. Identify eligibility criteria for home education student participation, not to exceed those required of other dually enrolled students ... (14) Instructional materials assigned for use within dual enrollment courses shall be made available to dual enrollment students from Florida public high schools free of charge. This subsection shall not be construed to prohibit a community college from providing instructional materials at no cost to a home education student or student from a private school. Students enrolled in postsecondary instruction not creditable toward a high school diploma shall not be considered dual enrollments and shall be required to assume the cost of instructional materials necessary for such instruction.